The Avengers, more than any other movie, gives us a great big spotlight on the Agents of SHIELD! 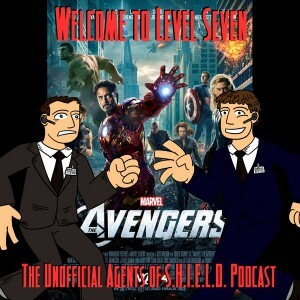 In this episode, the second part of our Avengers conversation, we talk about the story of the movie, discuss storytelling theory a little bit, explore the character interactions, and geek out about what makes this a fun movie while also geeking out about some of the weaknesses. We also give a mini-review after the credits about Disney's Phineas and Ferb: Mission Marvel. EDIT: Ben promised to embed this clip from Jeremy Renner's appearance on Saturday Night Live . . . I went to a Marvel Movie Marathon that my local theater was having which showed Iron Man 1 and 2, Thor, Capt. America, and then the midnight showing of Avengers and to get ready for it I was watching the One Shots on YouTube and I was reading some of the comments about “A funny thing happened on the way to Thor’s hammer” and they said Coulson dies in the Avengers. I was so upset that not only did Coulson gets killed but it was spoiled for me. Though I admit I was really jealous of my friends who did this!